Truly, the most romantic island in the world. From the dramatic scenery to the privacy and amenities of the overwater bungalows, everything in Bora Bora equals a 10 on the romance scale. Resorts have been welcoming couples for over 40 years and their special amenities have been fine tuned to perfection. From sunrise to sunset, each resort has designed their own blend of unique romantic experiences for their guests to choose from. 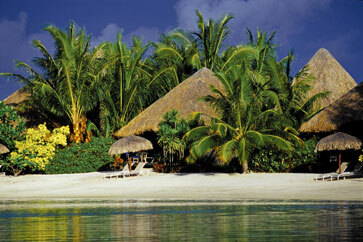 * Breakfast brought to your overwater bungalow's private balcony by an outrigger canoe regaled in flowers. * Gourmet picnic lunches enjoyed from a private beach on a motu. * Sunset sails aboard a private catamaran including four-course dinner and the sounds and emotions of live Polynesian music and dancers. * Sharing a lagoon-view table at one of the many fine restaurants. * Polynesian wedding ceremonies from simple to royal. Ceremonies can be at the resorts, onboard a catamaran at sunset, or on a private beach at sunset complete with musicians and dancers.